Chazey Partners, a management consulting firm specializing in Shared Services & business transformation will soon join industry leaders at the SSON Shared Services & Outsourcing Week (SSOW) Autumn event being held September 25–28 in Berkeley, CA. During the event, Phil Searle, CEO & Founder of Chazey Partners, will be presenting an interactive workshop to share the strategy of next level shared services optimization and development. “It is an undeniable fact that Shared Services industry has entered a new era with the emerging technologies like Robotic Process Automation (RPA) and other mega trends impacting the traditional operating model. We are excited to share our proven approaches with those who are looking for new ways to enhance performance, embrace new technologies and add value,” commented Phil Searle. 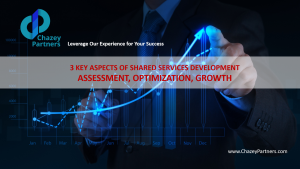 The workshop will walk you through the implementation strategies of the 3 key aspects of Shared Services development including Assessment, Optimization and Growing. To access to the presentation material, please fill in the ‘contact us‘ form and we will send you the slide deck. For information about the conference, please visit the event website.